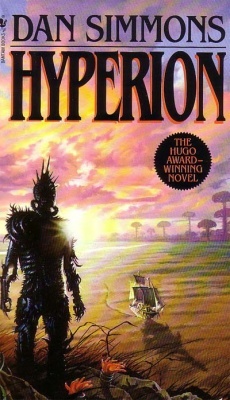 Dan Simmons’s Hyperion is by far one of the best sci-fi novels that I’ve ever read, up there together with Dune and – sorry to say this, Ender fans – better than the two Ender novels I’ve read so far. Now, before I launch into why this novel is so good, I’ll make a caveat on taste and quality. ‘They’ say that there is no accounting for taste, but I believe there is as far as craftsmanship goes. There is a difference behind enjoying a novel and taking a look at the way it was constructed to tell a story that is realistic (if necessary), credible (always necessary), mind-bending (by posing some interesting/important questions) and immersive (because fun must be factored in, too). The first surprise I’ve had was to discover that it is actually a frame story, where each of 7 characters embarking on a mad pilgrimage tell their stories, hoping that it will shed some light on why they were chosen to meet the greatest horror discovered so far in the known Universe. The second surprise was the first story. The third surprise was the second story. The fourth surprise was the third story … and so on. Each of the stories is so different, yet so extraordinary and unexpected that each could have easily been a novel by themselves (or a movie – and I’m not the first one to say this). All six of them (yes, six, not seven, but I’ll let you read the book to learn why) are, of course, connected to the mysterious figure of the Shrike, the alien (in the worst possible sense of the word) entity that some revere as a god, while others seek to destroy as if eliminating a pest (well, a pretty horrible one). However, the strongest point of the six stories is not just how different they are in content. It’s the style, too, their voice, their personality changes tremendously based on the characters. The posse that Simmons has created provides one of the most heterogeneous assemblies of high-contrast, well defined and individualized characters. Creating such a group is a challenge from the outset, but Simmons turns the fact that they are always together, with a constant danger of ‘not being who they should’, into an asset for the book, as contrast between them furthers their individuality. There is a lot to say about meaning and deeper ideas in the book, but … where should I start? From politics and hunger for power to humble personal discovery, from the relativity of philosophy, literature and history to God, from science to issues of ecology and eco-terrorism, the novel touches all of them raising interesting questions for those who are looking for more than just a good action-packed story. I’ll close here, with a warning. Make sure you have The Fall of Hyperion (second novel of the Hyperion Cantos) handy by the time you finish this. Trust me if you don’t enjoy going cold turkey. 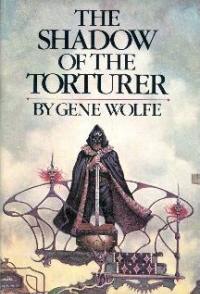 While trying to second guess what familiar things gone wrong lie at the origin of curiosities populating Gene Wolfe’s bleak vision of the future makes the experience more intriguing, it is words that struck me the most in Shadow of the Torturer. This is a good fun book, but it wouldn’t have claimed those awards and nominations without some good writing to back up the story and the charm of it comes first of all from words. Peltast, chrism, monomachy, fricatrice, exultant, autarch, fiacre, sabretache, destrier, chiliarch, portreeve, abacination, cangue, bartizan, flageolet, lambrequin, mensal, pavonine – should I go on? What strikes me the most is that all of these and many other like them that Wolfe generously uses in the book are real words, not inventions of the author, as it is often the case in SF&F. Many of them have their original meaning preserved, but by using them instead of a more regular (shall we say ‘banal’ version), the author builds a feeling of eeriness in the book which I cannot describe with full justice – you really ought to read it to get it yourself. The eerines is pushed even further by the somewhat illogic nature of the characters, I often felt that they acted bizzarely, driven by motivations which are layed out in the open, fully explained and logical by their terms and those of the world they live in to some extent, but a bit alien for the reader. 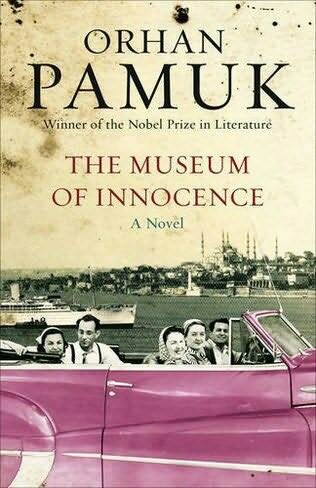 If you haven’t read Pamuk’s Museum of Innocence, you won’t of the magic contained in this phrase, quoted from a novel which tells the story of a love so uncommon and fascinating. Obsession is the first ingredient. Kemal’s unrelenting fascination with Fusun and every little thing connected to her is implausible, but, given the rest of his actions and decisions, it is the only credible proof of his love, together with the ever increasing humiliation he endures because of it. Time works in a peculiar way, suspended somewhere far away from the clock, turned by the flow of characters’ feelings like a gyroscope. Looking back on the whole story, I would say that, paradoxically, time is the only thing that Kemal (willpower and state of spirit completely out of his hands) can control is Time. He practices instinctively the secret art which Proust has sought his entire life a la recherché du temps perdu, yet he does it with the full refinement of an artist by mixing tastes, textures, flavors, images and sounds to alleviate his pain and fill the huge emptiness which only Fusun could fill in his life. This craft consists of small games like tasting her paintbrushes and smelling her pencils, reading emotions in the way she stubs 4 213 cigarette stubs over the course of eight years, stealing objects from her home and replacing them only to steal the new ones later on. While this fuels his obsession even further, it brings back slivers of the bliss experienced in the happiest days of his life, spent in adulterous love with her. Painstaking attention for detail is the strongest tool in the entire book, charging feelings with true meaning and turning Istanbul into an equally magical backdrop that goes beyond simple geography and imagery, all the way to people’s habits, personal histories and the conflicting values of ‘old’ and modern, ‘Turkish’ and Western and especially Male and Female. It is details which allow Kemal to extract ounces of lost time out of the smallest things. The last drop of tea left in an unwashed cup after Fusun’s lips have touched it MATTERS. She isn’t just the sum of her richly detailed features and mannerisms, but everything she thouches, breaks, uses, keeps or throws away, from the streets where she walks to the smallest cracked thimble. Remember the opening quote. If each and every little one of these entities wouldn’t painfully stand out for Kemal, he would be stripped of his magical powers over Time, just as the novel would be stripped of its unique magic, built out of all these three elements – obsession, Time and details – which would just not work if separated. What ingredients would you use to brew and serve the greatest love story you could imagine? This post is the first in a (hopefully long) series that I will call the Masterclass – basically, lessons provided by the best authors while doing what they love most: write. This one goes to George R.R. 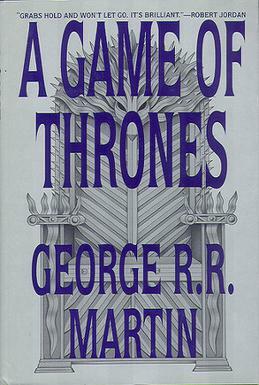 Martin and his characters, as “A Game of Thrones” is one of the richest books I’ve read in characters that you grow to love or bitterly hate. So, the question is … how does he pull it off? FATE – Martin’s characters go through a lot – and when I say a lot, I don’t mean just thrilling adventure, I mean trouble, pain and including death of some the major characters. They suffer, they are frustrated and they lose a lot along the way, in terms of fortune, happiness and loved ones. Martin really torments them – and they grow human, frail. Even more so, the prospect of a scene (which in most other novels would be just a thrilling moment with happy end) turning into outright disaster, makes the reader worry and bond even more with the trials and tribulations of all protagonists. PERSPECTIVE – each new chapter brings a change of perspective, as the POV is shifted between characters. In fact, this change is so powerful and sudden, that it is really fitting that the chapters have characters’ names as titles, instead of suggestive generalities. Challenges, people, places and situations are the same, yet they FEEL different since looking at them through the eyes of another character will not only provide a new perspective, but a new experience and different emotions. This is where I believe that Martin really shines, in making you feel the DIFFERENCE between his protagonists. While all of them can fit in some classic fantasy stereotypes, they way he handles their hidden thoughts and drives, as well as their personalities individualizes them and forces the reader to take a stand and choose a side, to some extent. I believe these are the things that contribute the most to the novel’s rich characters.